This is an Archives page; The painting is sold. Andre Normil was born in Port-au-Prince, Haiti on September 26, 1934. He joined the Centre d'Art in 1951. 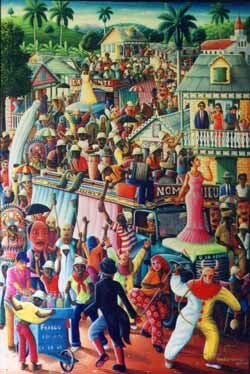 Besides being a technical genius, Normil is a sharp-eyed observer of the subtleties of Haitian culture. His paintings are often populated with likenesses of friends and are a delight to behold. Normil has been accused of being "commercial" and it is true that he does tend to repeat certain subjects, such as Carnival, Noahs Ark, Paradise and Weddings, because the demand for them is high. His monumental canvasses, however, depicting historical scenes or brothels or dechouke, are breathtaking. For decades now, he has worked in a small room on the ground floor of the Galerie Issa on the Rue du Chile in Port-au-Prince. 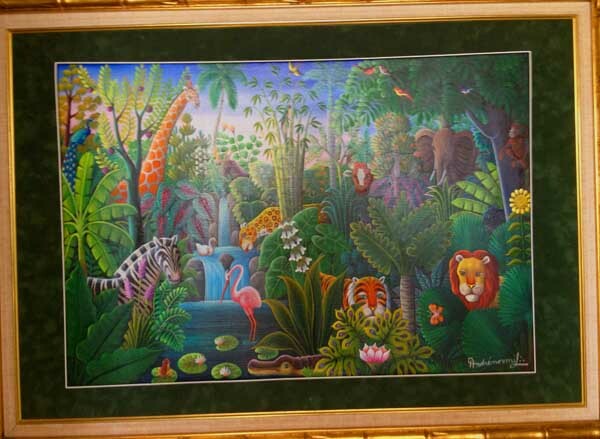 Normil is married to the painter Francoise Elliassaint. He habitually puts three dots in a triangular pattern near his signature. The three dots tell us that he is a freemason. Andre Norml passed on May 2, 2014. He was a legend. at any reasonable hour Eastern time.